“This is by far the best organized ride I've ever participated in. The sights and sounds, the people, the food, the support, the sponsors, and even the bike mechanics… everyone and everything is top notch." 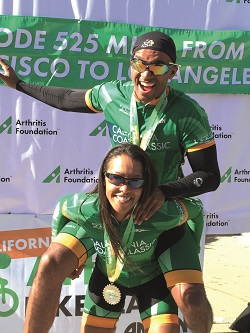 “For the past several years, the California Coast Classic's annual bike tour for charity has been our home away from home, in pursuit of raising much-needed awareness for debilitating forms of arthritis, especially among our most vulnerable populations in society. Together, it has been both an honor and a privilege to cycle every inch of the tour year-in and year-out with hundreds of other riders, volunteers, and support staff, whom also share the mission and vision of the Arthritis Foundation. It is our hope to continue our support for this cause for years and years to come, because ultimately, we are all… family." Rhiannon, who has Oligoarticular Juvenile Idiopathic Arthritis, is 14 years old. In addition to having to use a wheelchair from time to time, and needing an assortment of pills, shots, joint injections, and infusions, one of the hardest parts of her illness was not knowing other kids who had arthritis. The Arthritis Foundation helped Rhiannon by inviting her to Camp Esperanza, where she made many new friends. Rhiannon served as a youth honoree for the 2017 CCC Tour and her aunt and uncle rode to support her and our mission. She thanks you for riding and wants you to know your efforts really make a difference and help kids like her every day. 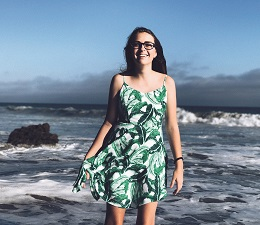 To learn more about Rhiannon's journey with arthritis click here.